Collapses among information and communication companies have fallen year-on-year for the first time in 2014. 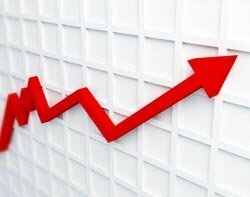 And the number of businesses that entered the early stages of the insolvency process in the sector has dropped sharply, according to the Exaro Insolvency Index. It marks a change in direction for information and communication companies, which have suffered year-on-year rises in insolvencies every month since December. The Exaro Insolvency Index, the most comprehensive survey of company failures in the UK, shows a similar pattern for the wider economy. Insolvency specialists say banks and investors are showing a growing willingness to call time on struggling businesses as an economy pulls out of a recession. But, as experts took comfort from the latest data, the UK economy may be entering a new post-recession phase of greater investment in areas such as IT. In April, 181 information and communication companies were going through insolvency, down a shade under 10 per cent from 201 for the same month last year. As the graphic shows, three companies in the sector entered administration or receivership – down from 11 in April 2013. Winding-up petitions dropped by more than a third, from 53 to 35 in the same time. However, the latter stages of insolvency, orders or resolutions to wind up and appointments of liquidator, saw year-on-year increases. Clive Lewis, head of enterprise at the Institute of Chartered Accountants in England and Wales, said: “Business confidence is at an all-time high. This is when companies start to invest and the IT sector will benefit from this. But he warned: “The crunch will come when interest rates start to rise. Despite falling levels of insolvency among information and communication companies,developers continue to struggle. But the rate of increase has slowed. April saw 16 such companies file one or more insolvency notices, up from 15 in the same month last year. In addition, 70 IT or software consultancies were going through insolvency last month, down from 80 in April 2013. But there was a year-on-year increase in the sub-sector for companies specialising in data processing and hosting, up from four in April 2013 to seven last month. Birmingham-based Netshield is an example of a company in the sub-sector that has collapsed, filing for administration last year. Moore Stephens, the accountancy firm, acted as administrators and arranged a management buyout of Netshield’s business, saving all its 17 jobs. The new entity is trading under the Netshield name, and the old company announced last month that it would be liquidated. Despite the improved picture for information and communication companies last month, the quarter to April saw an increase of 15 per cent in insolvencies on the previous year. In the quarter to April, 607 companies filed one or more insolvency notices, up from 526 for the same period last year. The Exaro Insolvency Index draws on insolvency notices in the London, Belfast and Edinburgh Gazettes, combined with information from Companies House. 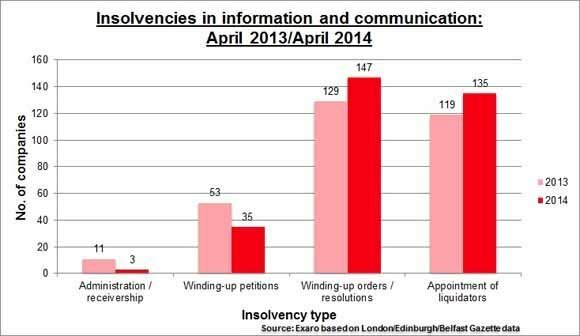 In the source data, a small proportion of the insolvencies is not ascribed to a specific sector.